I want to use a different (or longer) portion of a video in my Story than what the app picked. How can I do that? 1. When editing your Story, click Scenes. 2. Click the pencil icon on the video and select Set start and end time. 3. 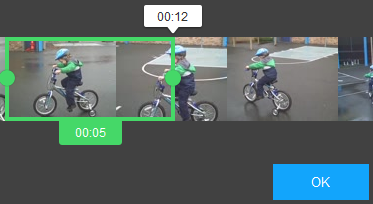 Click and drag the green dot at the beginning of the clip to change where it starts, then click and drag the green dot at the end of the clip to change where it stops. You can make your clip any length, as long as the overall Story length is not longer than what your plan allows (the free version of RealTimes only allows 30-second Stories; the Premium and Unlimited plans allow any length you want). 4. Click OK when you are done, and finish editing your Story. NOTE: If you want to use different portions of the same video, select Duplicate, and then go through steps 1-4 above on the copied clip to select the second portion you want to include in your Story.